Team Challenge Company and Mercure Ardoe House Hotel welcomed their clients to the magnificent hotel to take part in our joint client evening event to showcase a selection of brand new corporate activity ideas, from our Beat the Clock package. As our guests arrived for the entertainment event they were welcomed with a glass of fizz. Guests had the chance to take part straight away in our brand new activity – Batak! Batak had only arrived in the office a few days before the event so our clients on the evening were the very first clients to have a go! Did they have the hand/ eye coordination to get the highest score? Clients gathered round to have a quick shot of Batak before the evening commenced. Prior to dinner we eased everyone in with the classic Hip Hop Skittle Drop, Team Two done exceptionally well as they managed to knock over their skittles in the fastest time. The guests got right into the swing of things as they donned their Olivia Newton John style 80’s headbands and got the tennis ball swinging to knock over the skittles. The perfect ice breaker for getting to know your new team! As we moved through for the wonderful Scottish themed buffet dinner, which was provided by Mercure Ardoe Hotel Hotel, talked turned to what our clients were taking part in next! After dinner, guests were split back into their teams to commence in a small selection of the new Beat the Clock activities. Our guests had on offer, Batak, Transporter, Omelette Making and Build the Clock Tower, all under pressure, all against the clock. Our teams moved round each activity trying to get the lowest time at each activity. Team Three were fantastic at Batak, however, unsure that they understood that you had to wait until the pad lit up before you had to hit it! With arms flying around, they reach the target in seconds! All teams struggled with Transporter… It looks much easier than it is. The team has to get the ball from one side of the activity, to the other, using tubes connected to ropes, controlled by the team. This takes a lot of skill and patience and when you’re against the clock, this is very hard to control! Only one team managed this within the allotted time, well done to Team Four with a very impressive time of 4 minutes 45 seconds! The chefs of Mercure Ardoe House Hotel took to their omelette making stations to help our teams and judge our omelette making contest. Which team could make their (edible) omelette in the fastest time? Simple? No. Some members of the teams had never made an omelette! One even confusing the challenge and making a fried egg! Well done to Team One who made their omelette edible and in the fastest time! Clock Tower proved very difficult for Team Two who struggled to get the right balance as each member of the team took a rope which operate the ‘crane’ and the team had to manoeuvre the crane to build a clock tower. The little tower blocks proved very tricky to pick up as this activity took a steady hand and a lot of team work. Well done to Team Three who completed this in an amazing time of 1 minute 28 seconds. All in all, the event ended on such a high… No one wanted to come last but there could only be one winner. In fourth place with 15 minutes and 25 seconds on the clock, Team Four! In third, Team Two with 14 minutes 40 seconds. The fight for first place caused a tense atmosphere in the room… Well done to Team One who came in second place with a very good time of 12 minutes and 27 seconds. But a huge congratulations to Team Three who had a very respectable time of 11 minutes and 57 seconds on the clock and took home the Team Challenge Company Winner’s Trophy. We want to thank each and every client who came along to the client entertainment event at Mercure Ardoe House Hotel. It was lovely to see each and every one of you and we do hope to see you all again very soon. Our thanks also go to the Team at Mercure Ardoe House Hotel, who helped organise and host a wonderful event. It was great to welcome everyone to Ardoe House Hotel for such a fun night! (Although I feel a little hard done by due to being on the losing team!!) Can't wait for the next event to see what fun activites Team Challenge have for us. Had a smashing time with everyone as I watched the eggs fly everywhere at the Omelette Making Challenge Stations! Absolute hilarity broke out when fried eggs were getting made instead of omelettes! Thank you again to everyone for their support in making this such a fantastic showcase. Look forward to seeing you all very soon at you very own Beat the Clock! Well our last showcase of the year with Mercure Ardoe House Hotel and what a fantastic way to round them off! It was great to see so many come out on what was a bit of a chilly evening to enjoy our brand new Beat the Clock Challenges! As always great to put a face to the email address and introduce to our team. Looking forward to 2015 and our Summer showcase hope to see you all there!! Well done to everyone for the sterling effort they made on the transporter! Not as easy as it looks! I am sure we will be seeing you again soon so you can have another go! What a fantastic event! We really appreciate how everyone made such an effort so we could showcase our very new Team Building Activity - Beat the Clock. We all had great fun. See you all very soon! Thank you to everyone for coming along to Ardoe House Hotel, we all had a great night and I know you all did too! We hope to see you all again soon in the very near future. 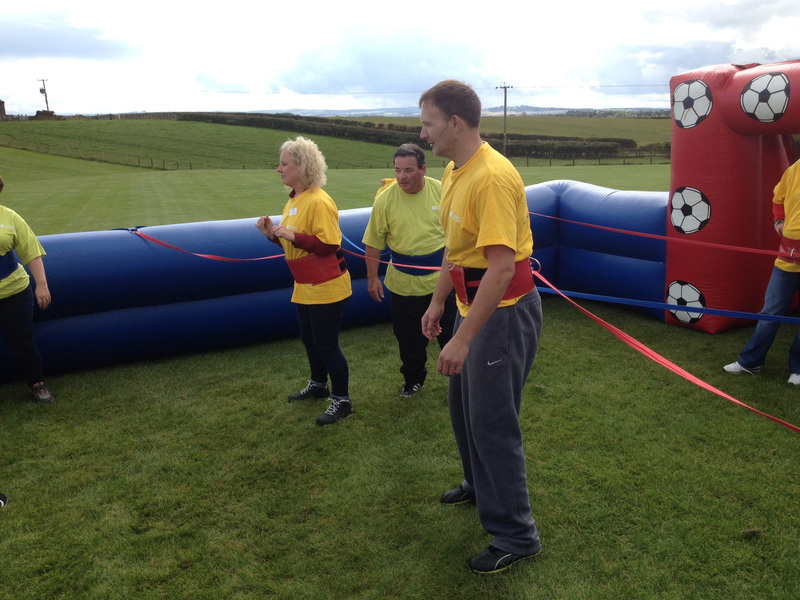 Had such great fun at the Team Challenge Company and Ardoe House Hotel Client Entertainment Event. Thank you to everyone for making this night one to remember. We hope you had as much fun as we did!